Imagine your self at a guitar concert. The music is beautiful, and you’re lost in it. There you hear a terrible buzz — a missed note — and your reverie is broken. Most classical guitarists come from some sort of rock or popular music background. So think back to your first guitar lesson. What did you do? Chances are you played some chords. Then you tried to move those chords around, and your teacher said that you should try to move all your fingers at once. Moving all at once is not necessary in much of the classical guitar repertoire. Our textures are different, and we don’t really have a lot of instances where block chords need to land all at once. The solution is sequencing. This one little change makes a huge difference in how legato and consistent your sound is. This goes hand in hand with sequencing. Good guitarists find ways to prepare for the next movement before it happens. In other words, think how you can prep unused fingers for the next shift or movement. You could extend the first finger to prepare for a barre or hover an unused finger over the string where it will be placed next. The other half of this is keeping unnecessary fingers down. Unless a finger is fulling a musical (controlling open strings, respecting note values, etc) or technical (a guide or pivot finger, etc) purpose, it probably shouldn’t be down. Why do we do this? Because it’s easy to be lazy and not worry about picking fingers up before we have to. But the truth is that, while it is easy to keep left hand fingers down, often times those fingers create problems in shifting and legato later on. So drop them. And try to incorporate those newly freed fingers into your preparations for the next move. Hand position matters a lot for the left hand. Does your hand need to be angled or straight? Sometimes it’s easier to do one or the other. But the real value in paying attention to your left hand positioning is not that it makes things easier. Find a left hand position that works well for a given passage or motive and you’re able to replicate it in practice — you can getting into and out of this new hand position instead of leaving it to chance. That’s awesome. All of the above have one thing in common: they involve being aware. They involve you stepping up your practice focus and getting your left hand to do the things you need it to do. The good news is the more you pay attention now, the more good habits — like sequencing, preparation, and good hand position — take over and become the default. Hey Chris, great post. I’m plagued by what I always called “blocking,” moving fingers en masse from one shape toward another, which kills the last note played, as well as affects accuracy. I’ve been practicing sequencing, and find I’ve got a lot more time than I think I have. Good players’ hands move like spiders. Great points here Chris. I have recently found that practicing a piece slowly opens up my awareness. It may take me several times but gradually I begin to notice more things. It’s like searching around a room with a flashlight. The more I carefully look, the more I begin to see. By practicing slowly I can begin to notice where I can apply these three points. True. You just have to watch out, sometimes the movements that work slowly don’t work at tempo. Sequencing is a good example of this: sometimes its easier to put down 2 fingers at once rather than just one at a faster tempo. Unless you know your technique really well, it’s hard to determine if that’s the case for you while playing under tempo. 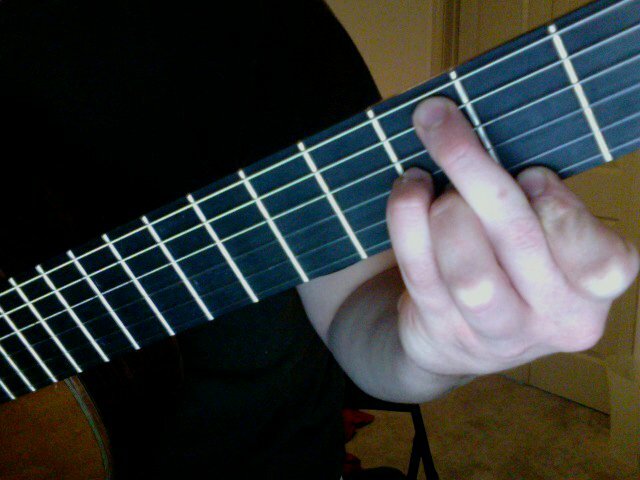 Also, playing as close to the frets as possible helps prevent buzzing, and gives the fingers an anchor. Thanks, I love your blog. I’m a very beginner (I know 3 songs now), and this reinforces what my teacher said, but in different ways. And it’s great, because I’ve been getting buzzier, lately & it reminds me of what was said. Wow, fantastic article. While I don’t play classical guitar, these are things I’ve been discovering as well for non-classical music. Especially the first point and last point. I used to assume that landing the entire chord at once was THE way to do it. That’s how I saw other people doing it and they seemed really solid. But now I know that doing it that way can be really difficult and ineffective for certain chords, especially barred ones. The last point about wrist position was brief but incredibly useful. It’s only recently that I’ve realized how much of a different a simple change in wrist angle can make to the ease of holding a chord. For example, a regular 6-string major barre chord. Straighter is better. Or playing scales on the higher strings. Angles work better. They feel more comfortable. These are great points that I often struggle with. Old habits are hard to break. However, if I learned them (i.e. attempting to land on a chord with all fingers), I can un-learn them. I really don’t like the term ‘picking fingers up’ this to me implies that we use a physical force to lift our fingers away from the strings which causes all sorts of unnecessary tension and is one of the most common problems I see in beginner guitarists. I’m a firm believer that you never ‘lift’ left hand fingers, you ‘relax’ them. Seems like a small thing but it makes all the difference in the world and can really help get rid of some of those ‘buzzers’. It will create a smoother left hand overall if you really take some time to practice relaxing your fingers off the strings as opposed to lifting them. Agreed. I tell my students the same: just relax the finger and it “falls off” the fretboard. But, I didn’t wanted to get into that here, so I went with the easy one! Great post! One thing I would add is premature release of fingers, particularly when one is going to be needed on the same note again soon. Often times a difficult passage can be made a lot easier by leaving a finger in place and letting the others work around it. …however when picking out individual notes (as would be the case if you’re using any kind of fingerpicking) you really have to pay attention to the order in which you place your fingers down. If you move the wrong finger at the wrong time, you’re potentially cutting off a note that needed to be kept ringing, but if you don’t move another finger, you’re potentially missing a note that you need! All in all, its really worthwhile breaking down each transition to make sure you’re using movements most effectively.